The forecast was calling for record high temperatures (a whopping 75 degrees here) so Jay and I packed the boat and headed out onto the water. 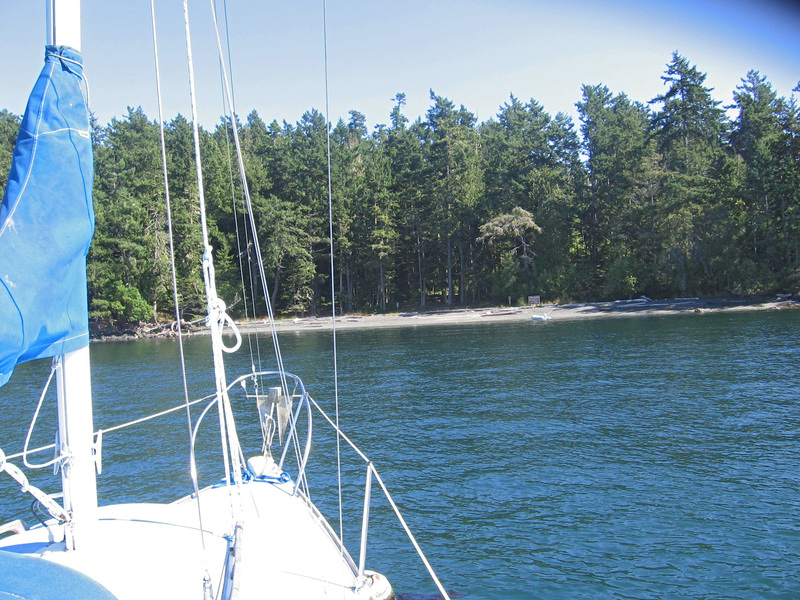 Our destination was Stuart Island, west of Orcas near the Canadian border. On this trip, I could mix business with pleasure as clients of mine own a large parcel on Stuart Island and had hired Permit Resources to permit a dock and a residence. It’s not often that I get to see the finished project — this looked like a good opportunity to do just that. We located the dock built by our Permit Resources client. Stuart has two harbors, Reid Harbor on the south side and Prevost Harbor on the north side. Both harbors provide easy anchorage, state mooring buoys, mooring cables and floats. 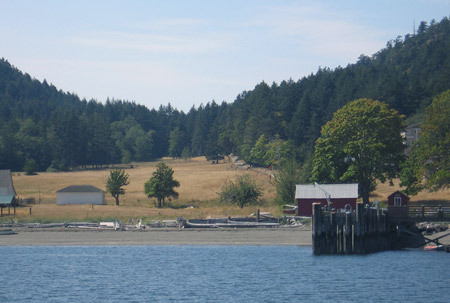 There is a County dock located in Prevost Harbor. 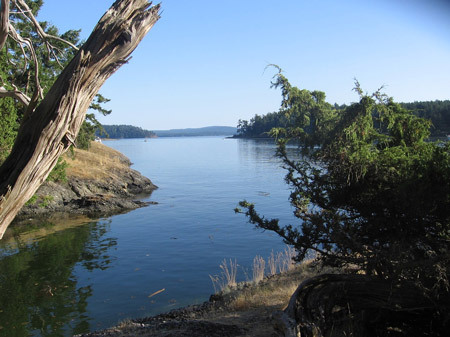 Stuart Island State Park lies between these two harbors and the park is easily accessible via public docks. We hiked up the road amid lush vegetation. The 85-acre marine state park allows for camping and provides miles of trails and county roadway for exploring. 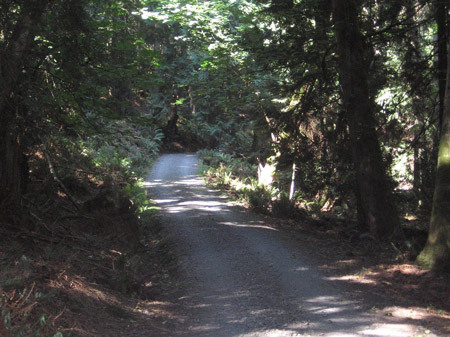 Keep in mind, there are vehicles parked at the county road end in Reid Harbor, but the road is nothing more than a wide gravel trail. A hidden cove in Reid Harbor. 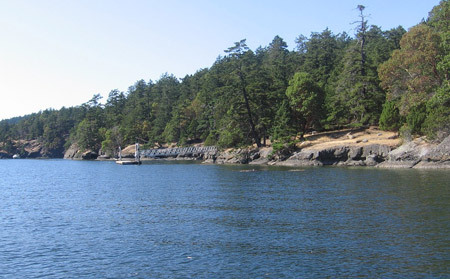 The environment is lush with a variety of native fir, maple, madrona, moss-covered rock outcroppings and hidden coves. A short hike will take you to the schoolhouse and museum where you will find the walls covered with history. There is an honor system for souvenirs where you can purchase T-shirts, cards and books. As I viewed the photos of school children from the early days, I wondered about the kind of cast iron constitution it must have taken to stand strong to the challenges of living in a remote island in the northwest. 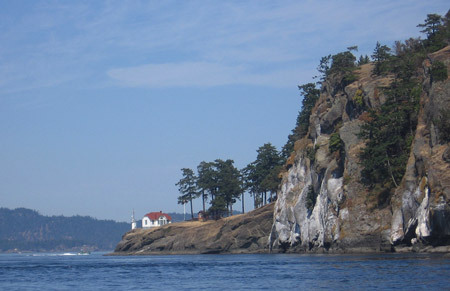 We sailed around Turn Point Lighthouse and Lover’s Leap. If you are a hardy hiker and make it to the north end, you will discover Turn Point Lighthouse where the shipping lanes of Boundary Pass and Haro Strait meet. We skipped the hike and circumnavigated Stuart on the sailboat, where we had a great view of the lighthouse. A welcoming view of Prevost Harbor. 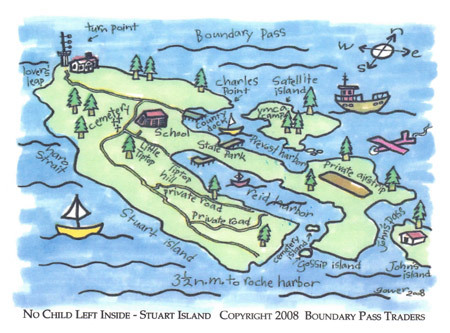 There is plenty to do on Stuart Island. We tried our luck at crabbing, clam digging and beach combing. All we can think about is: when can we return? As the cooler weather creeps in, I like to assemble my favorite memories of the summer to keep me warm throughout fall and winter. Topping the list this year was my birthday weekend in late August. I can feel the warmth all over again when I look back at this blissful picture! My first gift was perfect weather. 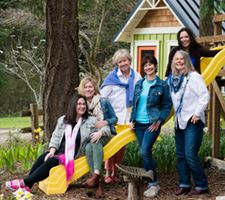 It started with my husband and I sailing to Deer Harbor Marina where four of my closest friends had prepared a dockside dinner. They treated us with fresh crab, marinated local prawns, melt-in-your-mouth corn on the cob, chocolate cake from Roses Bakery and lotsa good wine. The weather was ideal for a night on the dock, and visiting boaters were friendly all around us. 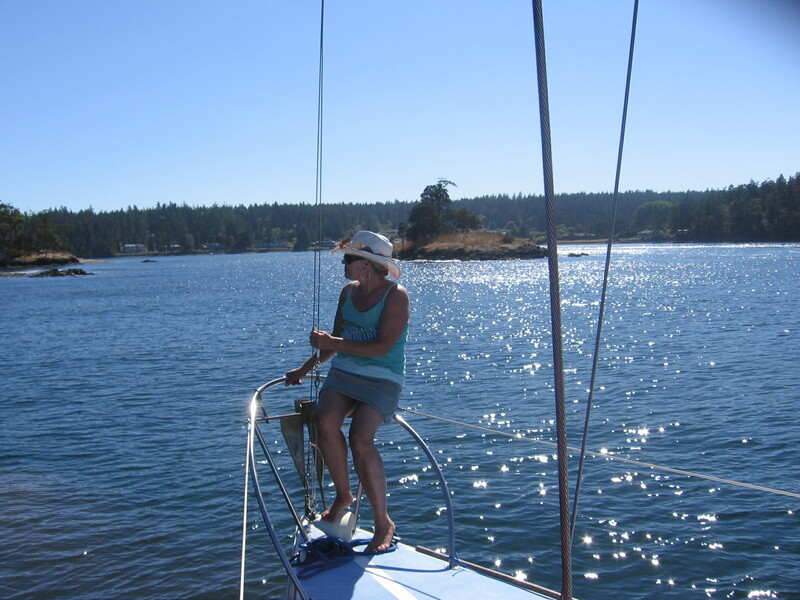 Saturday morning Jay and I headed out to sail San Juan Channel between Orcas and San Juan Island. 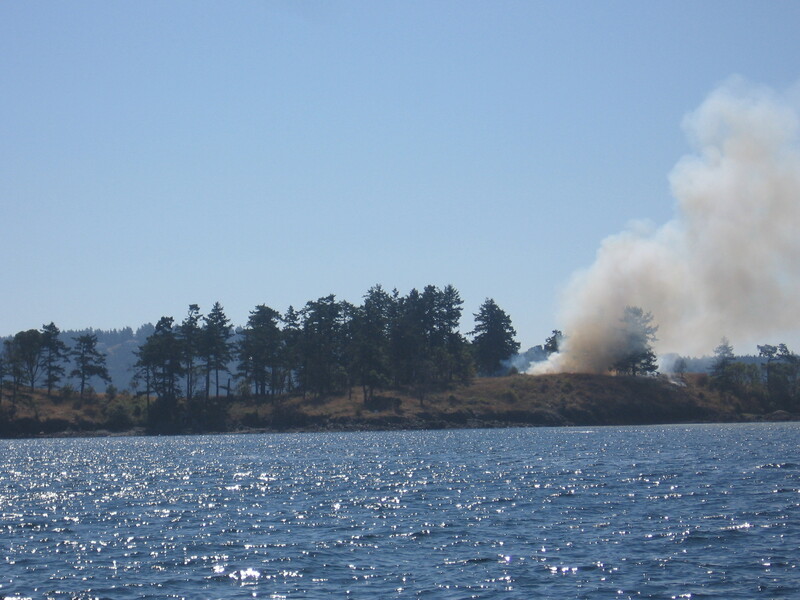 While cruising past Yellow Island we spotted smoke and called 911. We were relieved to find out this was an annual controlled burn by the Nature Conservancy to keep the undergrowth from encroaching on the grasslands – a practice first used by Native Americans to protect camas bulbs and other food crops. We continued out into the channel pushed by favorable warm wind. We were on the same path as the historic Adventuress and mirrored her course while feeling the pirate in our souls-arrrgh…. Only to be left behind with a few practiced tacks by the large crew aboard her deck.